The Dirty Donny has a massive range of sounds, some in Big Muff territory, some more radical. Huge range of quality fuzz tones. Well made. Costs £40 more than the standard version. Original Way Huge pedals (produced until 1999) are rare and sell for silly prices but, since designer Jeorge Tripps teamed up with Jim Dunlop to produce a new range, you can get new versions of many of those cheekily-named oldies. "A bit of experimentation will soon have you dialling in intense distortions and aggressive fuzz"
One revived pedal is currently available not only as the Swollen Pickle Mark II (£99) but in a new more compact version, featuring limited-edition artwork by rock artist Dirty Donny. It's not just the size and look that's different, though: the clip control, available as an internal trimmer in the Mark II, now manifests itself as a mini knob on the front panel, along with similarly-sized crunch, scoop and filter knobs and normal-sized level and sustain knobs (the Mark II's internal 'voice' trimmer has been dropped). 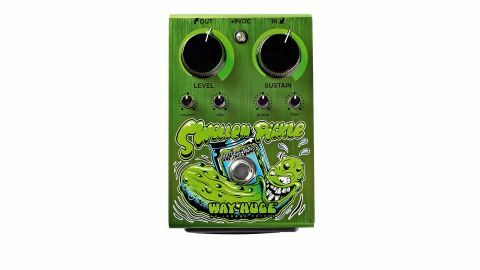 Described as a 'Jumbo Fuzz', the Swollen Pickle provides high-gain fuzz with a tremendous amount of bottom end and all the grunge sounds you could wish for. The filter knob sets the overall tone from woofy to razor-sharp, while the scoop knob does a number on the midrange and crunch tweaks compression. There's a massive range of possible tones courtesy of those four fiddly mini knobs, which can dial in some radical stuff that may not always be musically useful. However, a bit of experimentation will soon have you dialling in intense distortions and aggressive fuzz with a shiny modern sheen.